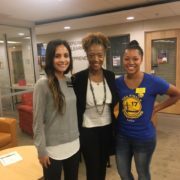 On October 4, 2017, Tonya Kinlow met with students from Wooster University’s Center for Entrepreneurship to share her insights on transitioning from the corporate arena to entrepreneurship. She also discussed her driving motivation for creating UGottaEat. Tonya Kinlow with a few Wooster University students. Tonya is the Founder and President of UGottaEat, a social networking site created to bring awareness to mindfully feeding our bodies, social engagement with our community, and actively eliminating waste and hunger.